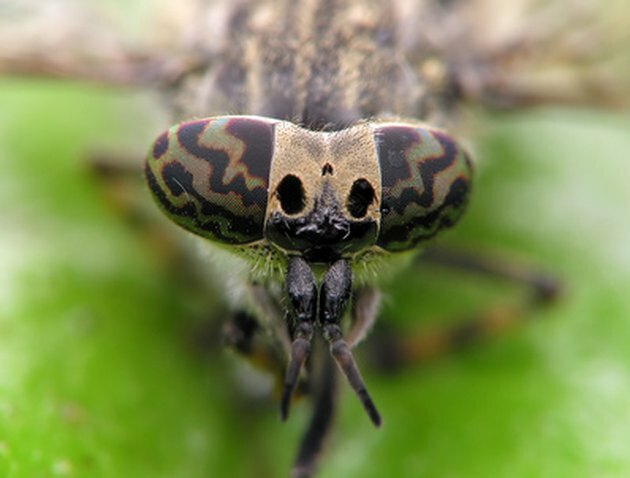 Manitoba fly traps, sometimes referred to as canopy-style fly traps, are used to help reduce the number of horseflies active in an area. They are often seen around or in pastures used for cattle or horses, as these animals are particularly targeted by the large, biting flies. Invented by an entomologist in the 1970s, the Manitoba-style trap uses basic fly behavior rather than insecticides or chemical bait. Flies will typically try to fly directly up to escape confinement, where they become trapped in a jar and die. These traps are simple to make with materials available at any hardware store, and several of them can significantly reduce the prevalence of horseflies in an area. Manitoba fly traps are especially effective against horseflies. Cut the screening/sheeting material into four triangles, each with a base of 3 feet and two other legs 4 feet long. Mix the epoxy as directed by the packaging and apply a thin layer of it to one of the 4-foot edges of a triangle. Attach the 4-foot edge of one of the other triangles to the edge, starting at one end and smoothing the sheeting as you go so that no bubbles form and allowing the joint to dry. Do this until you have a four-sided pyramid made of the sheeting material. Cut the top few inches off the tip of the pyramid. This will be the hole by which the flies will enter the trap above the pyramid, or canopy of the trap. Cut a 3-inch-diameter hole in the center of the plywood using the hole saw. Use more of the epoxy to glue the outside edge of the hole in the top of the canopy to the inside surface of the hole in the plywood and allow it to dry. Cut a 3-inch-diameter hole in the center of the lid of the 1-gallon plastic jar and glue it to the face of the plywood opposite that to which you attached the canopy such that the holes in both line up. Cut the tip off the funnel so that the diameter of the hole is at least 1 to 2 inches greater than that of the electrical conduit. Glue the base of the funnel to the inside of the lid so that the center of the hole in the tip of the funnel lines up with the center of the hole in the lid and plywood. When the epoxy has dried, screw the jar into its lid. Cut four small holes, one near the tip of each edge of the pyramidal canopy, and epoxy grommets over them such that the hole in the grommet lines up with the hole in the canopy. You can also apply some epoxy to the netting under the grommet to beef it up and help ensure that it doesn't tear. Cut four 4-foot lengths of electrical conduit and one 6-foot length. Drill a hole large enough to feed the clothesline through in the end of each length of conduit. Lay out newspapers and spray-paint the beach ball black with several coats of paint, waiting for each to dry before moving on the the next. Use epoxy to affix one end of a 3-foot length of clothesline to the ball and tie the other end through the hole in the top of the 6-foot post. Dig a 1.5-foot hole in the location where you want to put the trap and brace the 6-foot length of conduit upright in the center of it. Backfill the hole with gravel and dirt, and place heavy rocks around the conduit post to help brace it in place. Dig four more 1-foot holes equally spaced around the first post at a distance of about 4 feet and plant the 4-foot posts in them, bracing them in place just as you did for the first. Put the canopy over the center post so that its top goes through the hole in the plywood and up into the jar. Run lengths of clothesline from the grommets in the canopy corners to the other four posts, pulling them so that the canopy is stretched taut. The fly trap is complete. Horseflies (as well as deerflies) will be attracted to the infrared signature of the beach ball. When they discover it is not prey, they will attempt to fly up to escape, crawl into the jar, become trapped, and die in a day or so. Just remember to empty the jar of dead flies every now and then.